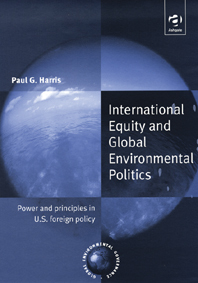 Paul G. Harris, International Equity and Global Environmental Politics (Routledge/Ashgate, 2001). International environmental equity is a vital concern in efforts to address climate change and other environmental problems. Equity in this context is defined as a fair and just distribution of the benefits, burdens and decision-making authority associated with international environmental relations. International environmental equity, if made a reality, can help protect the global environment, and it can reduce human suffering. International Equity and Global Environmental Politics shows how equity found its way into global environmental politics and started to affect U.S. foreign policy. The United States has never done enough to take on its fair share of global environmental burdens. The book explains why. The imperfect U.S. response to the emerging international consensus on environmental equity resulted from concerns about environmental security, America’s pluralistic policy-making process, and the too-subtle influence of the principle of international equity per se. More broadly, the book discusses the implications for the world of embracing – or failing to embrace – international equity as a core objective of global environmental policy. Those who wish to better understand the importance of equity, justice and fairness – as well as the United States – in shaping efforts to address climate change and to protect the world’s environment will find the book useful.